Traffic: we all hate it. But we’re stuck with – and in – it. Or are we? 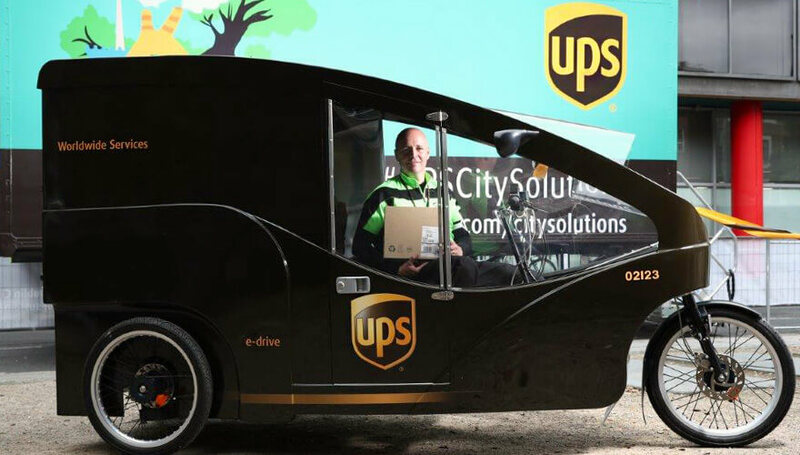 A new initiative from Dublin City Council (DCC) and delivery firm UPS is aiming to reduce the number of vehicles on the city’s roads. It uses what UPS call an “Eco Hub” container on Wolfe Tone Street. The Eco Hub acts as a small distribution hub from which deliveries can be made by bike or on foot. Nearly half a million commuters, visitors and residents travel within the city centre every day, and this is forecast to grow by 2023, so it’s vital that congestion is tackled. While larger items will still have to rely on vans and trucks, much of the commercial traffic in the city is from small vans and light goods vehicles, so this model could potentially be scaled out to more delivery firms in a carefully managed way. UPS Eco Hub container on Dublin’s Wolfe Tone Street. Artwork by Dearbhla Ní Fhaoilleacháin Ryan. The artwork for the project was designed by Dearbhla Ní Fhaoilleacháin Ryan, a recent graduate of the National College of Art and Design on Thomas Street in Dublin. Her graphic represents the heart of the city, and the beauty of Ireland’s countryside brought together. Improving the efficiency of “last mile deliveries” is a very live issue in Dublin at the moment – the city council is currently involved in another initiative which seeks to reduce the number of goods vehicles on the streets and improve air quality and noise pollution. In partnership with Enterprise Ireland‘s small business innovation research fund, it’s asking the business community as a whole to submit other ideas to improve the efficiency of “last mile deliveries“. The Eco Hub project was first trialled in Hamburg back in 2012, and it saw a reduction of between seven and ten vehicles in the city centre every day, reducing carbon emissions by 70 metric tons. Other projects are being rolled out in Austria, Belgium, France, Germany, Italy and the UK.